Our most important work today is preparing our clients for tomorrow. 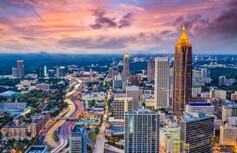 Our professionals regularly speak at industry events on such issues and are actively involved in the Council for Quality Growth, Georgia Regional Transportation Authority, Atlanta Regional Commission, Metro Atlanta Chamber of Commerce, American Planning Association, Georgia Planning Association, Georgia Quality Growth Partnership, and Urban Land Institute Atlanta. Seth Weissman co-authored the book Zoning and Land-Use Law in Georgia.